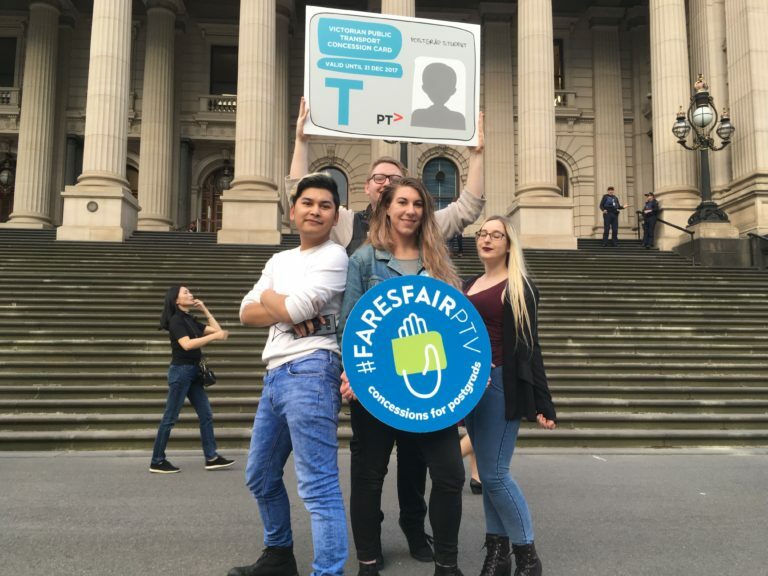 Fares Fair PTV, a coalition of Victorian university student associations, is working to secure student public transport concessions for full-time postgraduate students. The group claims the concession, which is available to postgraduates in all other states, would be beneficial as postgrads have the same limited earning capacity as undergraduate students. Graduate Student Association (GSA) president Georgia Daly, who studies at Melbourne University, said there was a common misconception about postgrad students that put the issue on the backburner. “There’s this perception that the average postgrad student is a 40-year-old coming back from work to get a promotion or to indulge in their intelligence,” Ms Daly said. The average annual income for full-time domestic postgraduates and higher degree students is $25,330 and $35,634 respectively, a report by the Centre for the Study for Higher Education shows. Average hours that students work during the semester have also risen from 17 to 20 hours per week for postgraduate students, and 8 to 10 hours for higher degree students. Ms Daly said a public transport concession would mean not “having to do math” every time a student bought lunch during the week. The group said they had been in touch with Public Transport Minister Jacinta Allan, and she told them the concession would not be extended to postgraduate students. A spokesperson for the Minister said the department was helping those who needed it most, offering low-income postgraduate students access to concessions if they held a Health Care Card issued by Centrelink. However, only a handful of postgraduate degrees are supported by Centrelink. These are Masters by Coursework and access is dependent on approval by Centrelink and the Social Services Minister after a university submitted a degree for consideration. Council of Australian Postgraduate Associations vice-president Vibol Hy said not offering postgrads concessions was “extremely exploitative” as their earning capacity was “severely hampered” by course loads. “We just need help during those years where we’re just struggling students,” Mr Hy said. Sarah, a Juris Doctor student at Melbourne University, said it could be difficult because a many postgraduate students in law went straight from undergraduate to postgraduate study and were not able to work full-time. “We’re not able to work as much, it’s a big difference and it would be nice to have a concession [as] it would definitely alleviate some stress financially,” she said. Public Transport Users Association member Ben Lever said he supported extending transport concessions to full-time postgrad students in line with concessions for full-time undergraduates. “There is no real reason to make a distinction between the two,” Mr Lever said. He said an increasing number of students did postgraduate study to get jobs in their chosen fields and faced similar barriers to their undergraduate peers. “[Postgrads] have highly variable work hours and incomes which make it harder to qualify for a Health Care Card concession even when their overall income is quite low,” Mr Lever said. Ms Daly said the GSA had spoken to a number of politicians including the Parliamentary Secretary for Public Transport Ros Spence, who had been “really supportive”, as well as Melbourne City councillors and members of the Greens and Liberals.